Over 200 deaths reported because of Acute Encephalitis Syndrome (AES) and Japanese Encephalitis (JE) in West Bengal. According to the latest figures available with the Health Department, so far 206 persons have died of AES and JE in the State since January 2014. Of the 206 deaths, 37 are because of JE. Dr. Satpathy, Director of Health Services said 92 deaths have occurred in the State in less than a month since July 7 after the outbreak was reported in north Bengal. Of the 92 deaths, 28 are because of JE, he said. Despite attempts by the State government to contain the spread of encephalitis in north Bengal over the past few days there have been reports of the mosquito-borne disease spreading to districts of south Bengal as well. According to state health officials that at least two deaths have been reported in the districts of south Bengal. While a child died of acute encephalitis syndrome in Bankura district on Sunday, and a person had died of Japanese encephalitis in Murshidabad district. 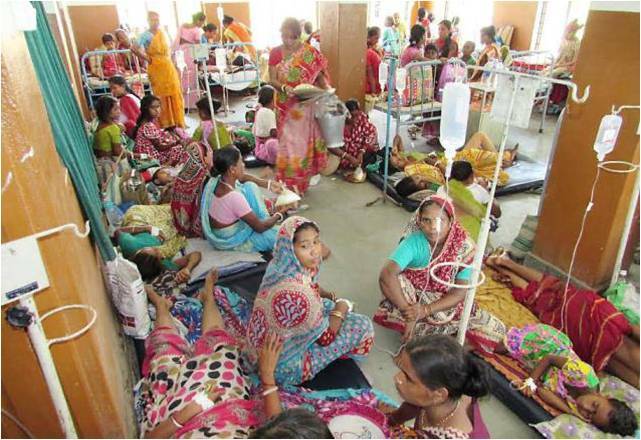 Patients suffering from encephalitis at the State-run hospital at Dhupguri in Jalpaiguri district. Around 700 people have lost their lives due to encephalitis that has hit four states, including Assam and West Bengal, the government said in Lok Sabha today, as members demanded that the disease be termed as an epidemic. The disease has claimed 208 lives in West Bengal, 197 in Assam, 159 in Bihar and 123 in Uttar Pradesh so far this year, Health Minister Harsh Vardhan said. "In recent months, upsurge in cases of encephalitis has been reported from Eastern Uttar Pradesh, Bihar, West Bengal and Assam,". Health Minister said that, in the last few years, even adults were being affected by encephalitis, which was usually seen in children below the age of 15 years. The cases of Acute Encephalitis Syndrome (AES) reported from UP, Bihar, West Bengal and Assam stood at 501, 857, 1183 and 1,217 respectively, he said. The incidence of encephalitis has now spread to 19 states, affecting 171 districts and hence there was need for the government to organise an awareness campaign.